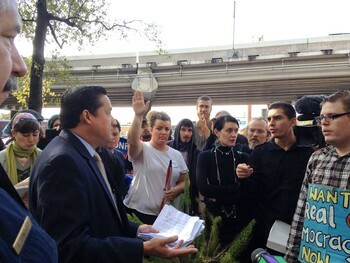 On Thursday December 15, 2011 the Houston Free Thinkers partnered with Occupy Houston to commemorate the 220th anniversary of the Bill of Rights by marching against the National Defense Authorization Act (NDAA). This bill includes provisions which allow for the Indefinite Detention of American citizens, and the loss of trial by jury, if you are seen to have committed belligerent acts against the United States, or have been labeled an Enemy Combatant. In attempt to stand against this bill, and stand FOR freedom the two groups, and other activists met at Tranquility Park in downtown Houston and proceeded to march through downtown towards the Mickey Leland Federal Building. The federal building is where one of the two Texas Senators, Kay Bailey Hutchison, who voted for this bill are housed. The crowd of about 40 pushed through the streets with chants of “VETO NDAA!”, and “This is what a POLICE STATE looks like!”, while the local media looked on. Upon arrival at the federal building we were met with a large force of officers, including Federal Protective Services (FPS), Department of Homeland Security (DHS), and Houston Police (HPD). There was a short street theater piece put together by Occupy Houston’s Caleb Travis which was designed to show how the NDAA will result in the detainment of American Citizens. During the theater I attempted to speak to one of the DHS officers to find out if it was going to be a problem for us to hand deliver our letters of disapproval to our Senator. Immediately the officers locked the doors, and within the building were 10-15 officers, geared up and ready to handle peaceful citizens. I was told we were not allowed to go into the building because we were having an illegal protest and did not have a permit. I informed the officer we do not need a permit to speak with those who are supposed to represent us. After a short back and forth, the officer agreed to bring out a representative of Ms. Hutchison to speak with us, but not without giving my identity to DHS first. The march concluded and led into street action and info jamming the streets with information about the dangerous bill that is the NDAA. Later that afternoon, the two groups met up once more to repeat the morning’s actions, but this time directed to Senator John Cornyn’s office. We gathered at the busy intersection of Shepherd and West Gray to make signs and pass out flyers, before proceeding on our march. Again there were chants of “Restore the Constitution!”, and “VETO OBAMA!” Once we arrived at the building and began to walk towards the entrance to meet with out Senator, we were once again met by a large police force, including HPD and mounted officers. Immediately the officers established their boundaries, physically assaulting myself, Caleb Travis and others. After the thugs established their boundaries they informed us that we would not be allowed into the building to turn in our letters. HPD continually denied us our right to speak with those who are supposed to represent us, or even the ability to hand deliver the letters. Outraged at this, we took to the streets and surrounding the building as much as possible and pushing the boundary set by the police as far as we could. Finally, the officers relented and I was told myself, and Jamin Stocker, and Amy Price of Occupy Houston would be allowed to come into the lobby and meet with a Representative of Mr. Cornyn and hand in the letters. As we were led into the building it occurred to me how insane the situation was. We are always told we have representatives in government looking out for our interests, and if we have an issue we can write, call or visit them. Yet here we are, concerned citizens being denied this right TWICE in one day. Not just any day either, BILL OF RIGHTS DAY! What does this say about a supposedly free country when everyday Americans do not have access to their own “leaders”? Once inside we met with Jay Guerrero, Regional Director of Mr. Cornyn’s office (Jay_Guerrero@cornyn.senate.gov (713) 572-3337) , and were once again given the run around. First off, I was informed that we were not allowed to film the interaction. When we had been outside the building we were told the proper way to go about this was to set an appointment, but upon closer examination this claim fell apart. Mr. Guerrero said Mr. Cornyn was very busy, and rarely in his Houston Office, we also were told we could not have a schedule of his events. So Americans are not allowed to bring in letters, make appointments or actually see their reps. So how in the world are they representing us? We were told that Mr. Cornyn was very concerned with the indefinite detention provision of the bill. Mr. Guerrero read to us from a script given to him, the script provided the answers he was allowed to give. After we recognized the meeting was getting nowhere we thanked him and left the building. Street Action commenced again and the day winded down. Although we were unable to speak directly to the Senators, over 600 fliers on the NDAA were distributed and the actions received coverage on multiple local news stations. The irony of the day is that while we were protesting the Senators offices they were in Washington voting yes on the finalized version of the Senate bill. They once again have shown the city that they care not for our rights or the constitution. Here is a list of all those in the House who voted yes, and the traitors in the Senate as well. As we wait for Obama to sign this bill into law, and officially create a police state in this country, it is important to reflect on all that has come and what else is coming. Activists who have been watching knew this day would come, the public announcement of a police state. Now we wait as Americans will slowly be taken away in the night for expressing their discontent. Already in the works is the SOPA bill, which would work to censor the internet. The Police State is now out in the open and we can not stand by idly. Write letters, make phone calls, Occupy, march, get mad, just do something. Remember, YOU ARE NOT ALONE, the revolution is at hand and WE ARE THE RESISTANCE.